Eddie Hearn says we’ll know soon what Anthony Joshua’s next fight will be. Soon, real soon, we should know what Anthony Joshua’s next fight is. The sculpted Brit, who by now is such an attraction that he fights just twice a year, and otherwise enjoys the fruits of his labors in any number of gorgeous locales, might fight Dillian Whyte or Jarrell Miller, or less likely Tyson Fury, or even less likely than that, Deontay Wilder. AJ promoter Eddie Hearn was in NYC for the Friday night fights unfolding at the Hulu Theater in Manhattan, at Madison Square Garden, and before the scraps kicked off, he told media about the light heavyweight feature which would taking place in March, pitting Dmitriy Bivol against Joe Smith Jr. Bivol is newly signed on to do his fighting on DAZN, which was the platform home to the Friday bouts topped by a Demetrius Andrade vs Artur Akavov faceoff. I tried to get some insight into whether or not the Brooklyner Miller had inside track into the fight with Joshua, which could come in June. Before that, though, Hearn was asked what he knew about Wladimir Klitschko coming back. “Anything’s possible,” Hearn said, noting that he’d not spoken to Klitschko. “I don’t know,” Hearn added, and did admit that Wlad would not be fighting Dillian Whyte in April. Of that he was certain. He also touched on the May 4 Canelo Alvarez vs Danny Jacobs pairing; he said all credit goes to the DAZN crew for making it come to fruition. Hearn stated that this fight didn’t come together because Canelo vs GGG 3 didn’t get made. That fight wasn’t going to get made for May, so that made Jacobs the next best option. The Brit deal-maker said that he’s happy that this May 4 tango is not on PPV, and that makes the “PPV is dead” talk from Oscar De La Hoya and him that much more germane. 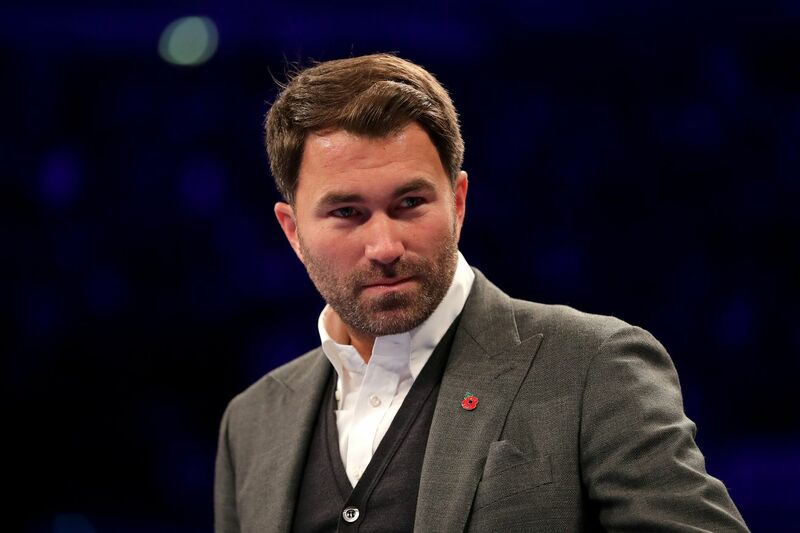 Hearn said that he is pumped that DAZN is going to be offering more good news, more intriguing fights, for the upcoming months, and that helps shut up the snipers who have been opining that DAZN is floundering some. He’s heard and read people taking potshots at DAZN and him, but he seemed pretty upbeat and not at all like someone who’s been deflated to an extent. The Englander said it helps him attract talent when a DAZN fighter like Jacobs lands a fat deal. But back to the heavyweights. Hearn said if a Deontay Wilder vs Tyson Fury sequel purse-bid occured, that would be an immense score for Wilder. Chatter had been that Wilder would be enjoying a 60-40 split, but Hearn said that Frank Warren, helping promote Fury, maybe isn’t as in the know about specifics in that realm as he purports to be. And also that he doesn’t think Fury has a great case to be wanting a 50-50 split. Anyway, Hearn has neither of those scrappers, so others have more info on those negotiations than him. He said that Miler would be a fine option at Madison Square Garden, because Whyte is a solid foe choice but it’s not a must-make fight. He said he will have news on the heavyweights and other weight classes, any day now. Hearn was also asked about him referring to Manny Pacquiao as faded and Adrien Broner as undisciplined. He said he wouldn’t be watching that clash, he’d rather use the funds to buy Errol Spence Jr vs Mikey Garcia. He likes the Bud Crawford vs Amir Khan fight, but he’s not happy about the PPV aspect. He said the price point in the UK is much more reasonable, and that the PPV cost in America is just plain too beefy. Basically, if the cost were brought down, in line with what they charge in the UK, then he’d not be so critical of the construct. Check out the video Q n A here.